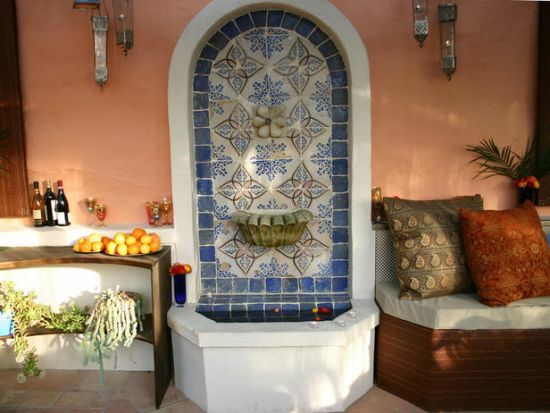 Patios of your homes can be decorated, taking inspiration from the beautiful patio decoration ideas from the land of Morocco, a country that is famous the world over for its stylish Moorish architecture. Morocco has been a center of confluence for many different cultures like Arabs, Romans and Berbers, each contributing a lot to the origination of the present day ‘Moroccan interior style’, a style so unique that it can transform your plain home to a dreamland that you have always imagined. Today, we are going to showcase some beautiful and exotic Moroccan inspired patios for your courtyards that are talked about these days everywhere. 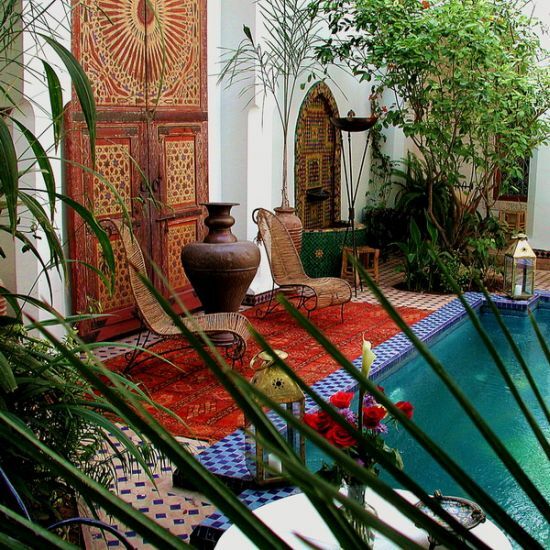 Moroccan courtyard ideas are quiet different than others as these involve the use of rich fabrics, intricate iron work, mirror art work and tiles, all elements woven together to create an artistic symphony! 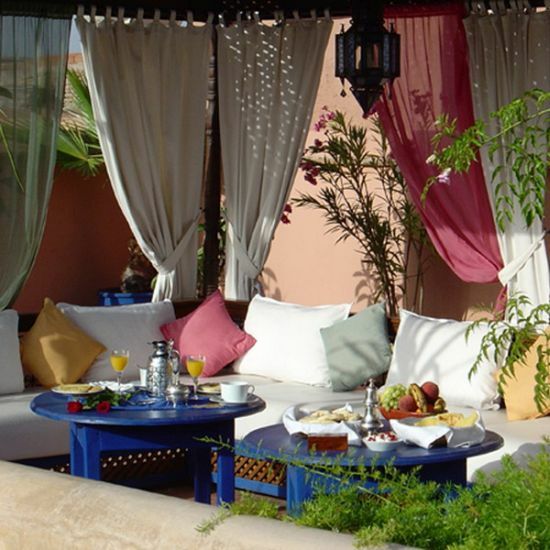 Take a look at these Moroccan patios that have a subtle charm to themselves. Moroccan inspired patios are the current favorite with many people designing their patios with vibrant Moroccan interior style patio ideas. If you look closely, you will see an electrifying mix of colors and fabrics that exude a feel of richness. The look of the patio is a perfect balance of old and new design concepts with a unique blend of light and dark tones splashed all across. The look of the decor is such that it allows one to showcase his or her enthusiastic persona by mixing rich accents and adding a zest that inspires good living! 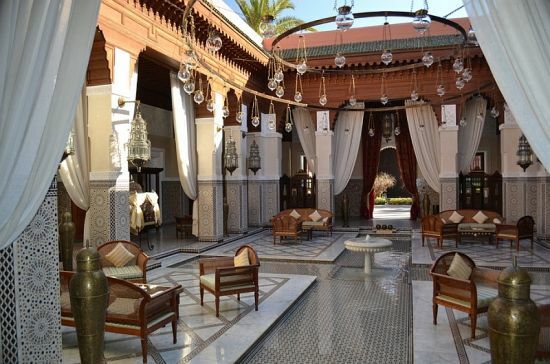 Any riad would seem incomplete without an exotic built fountain that is quintessentially Moroccan in nature. 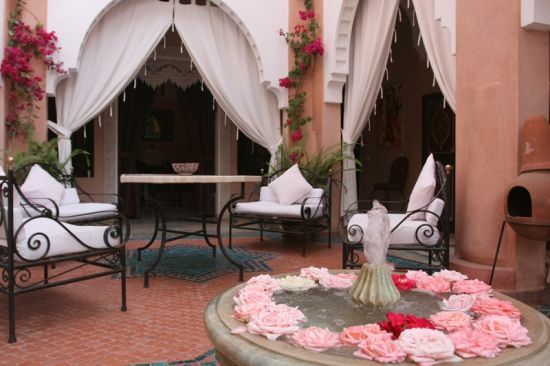 Every courtyard in a Moroccan riad is adorned with fountains that look dreamy and make you wonder if you are in the land of the flying carpets! The turquoise colored fountain adds a charming touch to the simple outdoor patio and is embellished with floral patterns that bear the signature Islamic architectural style of interior designing. The best part about styling your patios with Moroccan courtyard ideas are the uncharted boundaries one can enter as regards to choosing vibrant hues, rich tapestries and exploring newer concepts relating to patio decorations. One can let go of any inhibitions when designing their courtyards as per Moroccan patio ideas as these styles let your imagination run wild as can be witnessed here. The courtyard of this house is quite huge and is adorned with Moroccan styled floor tiles, traditional iron and lamp chandelier, traditional furniture and walls carved with beautiful motifs bearing Islamic influence. 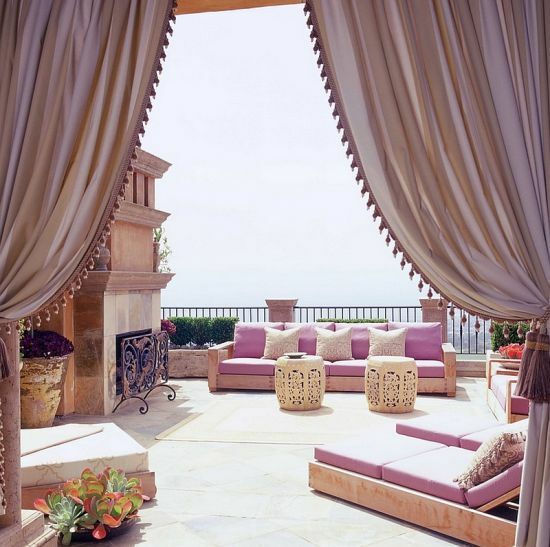 With rich flowing white curtains that seem to sway with each gust of breeze passing by, the patio looks stunning! Modern patio ideas that involve traditional Moroccan styles inspire a lot of people to implement these ideas when decorating their patios as Moroccan styles are easy to implement, whether your patio is small or huge. Patio designing, as can be seen below, makes use of traditional Moroccan decorative doors and windows, the facades of which are bejeweled with motifs and artwork, bearing testimony to the presence of timeless beauty of this exotic culture that is taking the world by storm. The patio garden is styled with plants and a small pool where one can relax. The light brown tiled flooring and the rug are Moroccan in design and make the courtyard look heavenly. Not only can you adorn your courtyards with traditional looking Moroccan interior style ideas, now a days, with help from designers, you can mix and match various other styles to infuse energy and life into your homes. The patio seen in the image is a cultural treat that spreads out its beauty like you have never seen before. The look is tropical with hints of greenery visible from the resting area. The white draperies add charming curves to the decor and remind us of the Middle Eastern style of adornment of tents nestled amidst the vast expanse of an Arabian oasis! 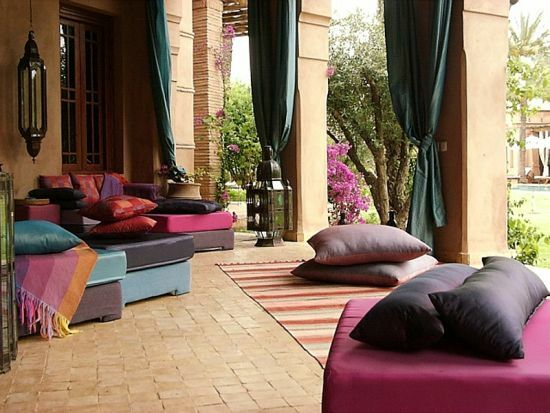 Moroccan interior style is not just restricted within the closed walls of your homes, rather, it can be extended effortlessly on your porches or patios that are considered an extension of your dwelling areas. With a few installations like ceramic pots, lamps, rugs and wrought iron furniture, one can bring in the essence of Morocco to their courtyards. The exotic patio seen in the image looks elegant with frilly draperies greeting you at the entrance, pink wooden loungers and couch, ornately carved ottomans and a rustic traditional iron stand placed just in front of the fireplace. Seen in the image is a beautifully adorned patio inspired from Moroccan modern patio ideas that has all the elements to lend it an exotic look. The patio seems to appear dazzling with a beautiful pool, shaded with trees and plants lining the borders. 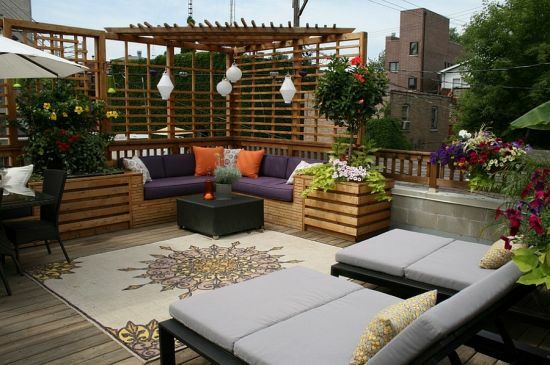 The traditional pots, mattresses and loungers add a cool touch to the elegant decor. Most noticeable fact about the patio design here is its simplistic treatment that helps in bringing out its true character. Patios designed as per Moroccan interior style ideas are flexible in adopting any kind of decorative concepts, either Islamic or Berber, typically amalgamated together to be called ‘Moorish’ architecture. The inner courtyard as seen below looks stunning with style oozing out from all quarters. 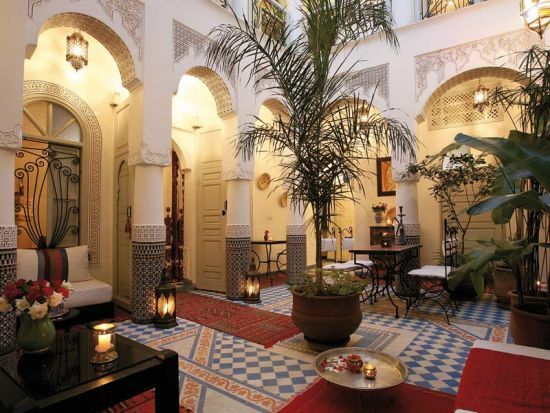 One look around and you will get to see many ethnic influences from Morocco like the patterned tiled floors, the curved pillars with Islamic patterns inscribed, the wooden short resting couches and the coffee table. The arched doorway with a huge wooden door bears Islamic touch with its facade being adorned with Moorish artwork. Other accessories like the brass lamps installed add to the glorious look of the courtyard. Moorish architectural ideas can transform your patios from regular looking courtyards to glamorous places just by adding some extensions that are easier to implement. The inner courtyard of this house looks a quintessential Moroccan dwelling place infused with curved arched ways, a vibrant palette of colors and tiled flooring. Just like a typical ‘riad’, the patio here gets adorned with a turquoise fountain pool decorated extensively with side lamps and a mystical oval motif imprinted just above the pool. ‘Oh what a stunning courtyard’ is what most of you would exclaim with exhilaration as the patio looks stylized from any angle! 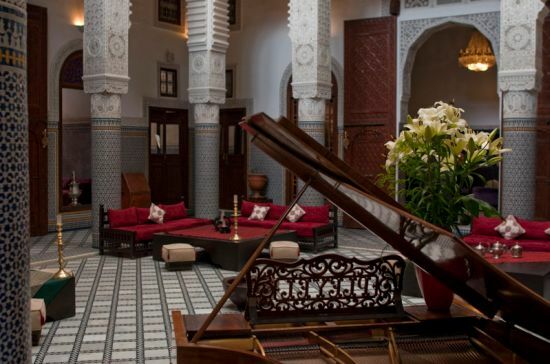 Most riads in the middle east resemble such opulent settings as you can all see. On a closer introspection, you may come across charming arched ways that resemble minarets with grandeur splashed all over them. These ornately carved arches and doors look ethereal. Apart from these, there are the traditional turquoise tiled floors adorned with Moroccan rugs. A lot of wrought iron furniture is seen anchored all over with embellishments on pillars that heighten the charming effect created by the whole Moroccan interior style ideas implemented inside the patio. One can blend many different styles together with Moroccan modern patio ideas when planning of home staging or designing. 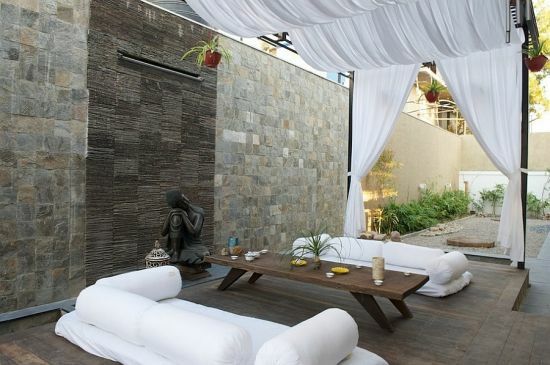 These courtyard ideas help you to infuse a number of styles like Asian themes that no others can. Now, one can fill their courtyards with a certain degree of exuberance that only Moroccan inspired patio designs can exude. 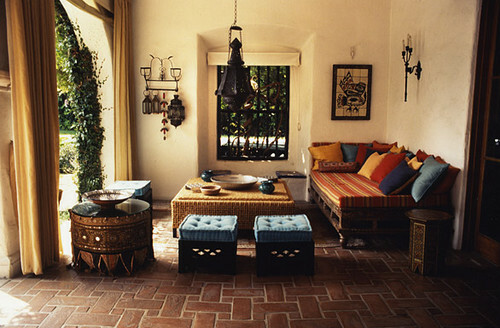 Seen here is a lovely Moroccan styled patio that imbibes hints from both the cultures, aka, the East Asian concept where one uses lot of bamboo and the Middle Eastern decor that makes use of traditional lamps and rugs. On entering the premises of this beautifully decorated patio, the first thing that strikes you is the principle facade of the decor dripped with arched doors, embellished pillars with curvaceous arches, wooden furnishing, unbaked clay pots displayed all around with plants, tiled flooring and a beautiful imprinted floral shaped fountain. 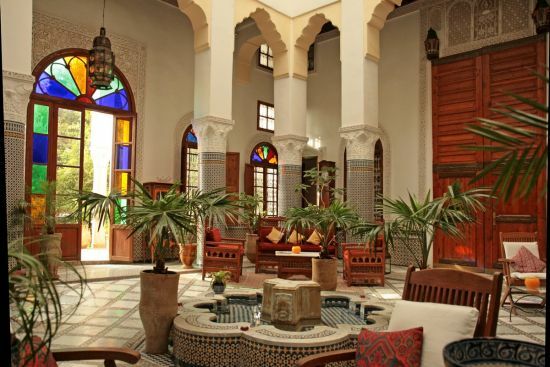 The decor is mesmerizing to the point that it takes you to ‘a world of souks and riads’ in a flicker of a few seconds. Moroccan patio decoration ideas can help you lend a distinct look to your plain patio as it is one style that allows you to play with myriad accents in every facet or feature of its decor. From plain white draperies to silken flowing fabrics, checkered tiled flooring, infusion of curved arches and fountains, one can explore a wide range of patio design ideas. The courtyard patio below looks regal and exotic in every sense of the term with white and pink curtains cascading down elegantly to offer a cool atmosphere where one can unwind. The lamp hung adds a distinct touch while the chunky couches anchored offer a comfy seating for the guests. The greenery surrounding the patio makes for some happy times that one can spend here. Perfect for lounging or hosting outdoor parties, the patio seen in this image looks like the interior of a bivouac anchored right amidst the great deserts of Arabia. The most charming element inside the patio is the color combo utilized that achieves perfection in blending all kinds of hues, lending a comfy touch. The Moroccan styled bed with colorful cushions blends well with the ornately carved accessories placed all around. One signature North African style present here is the roundel table with mirrored work that makes the whole space shimmer. If there is heaven on this earth, it has to be here…here…here in this gorgeously attired patio that takes its inspiration from Moroccan interior style ideas that help in making this courtyard a dreamy place to lounge around in style. The facade of the walls bearing arches look typically Moroccan in style and seem to bloom with beauty when the white draperies fall in a feminine manner. The highlight of the patio are the wrought iron furniture anchored that look stylish against the bougainvillea adorned backdrop. The fountain, with rose flowers drenched water gushing down adds to the ethereal charm. All one requires is some creativity and imagination to imbibe Moroccan interior style ideas that can easily be infused together with other design styles rampantly found like Japanese and tropical. From the tiled patterned walls to curvaceous minaret resembling arched doorways, your courtyard can now look dazzling with Moroccan design elements. See for yourself how such patios can add to the glorious look of your homes. All the very best exploring!